A chair bears the burden of life’s activities and, at the same time, portrays the expression of the space. Therefore, all the household articles should be precisely matched to ensure harmoniousness in simplicity and accentuate the purity of the style. The owner of the home is a young couple with two young daughters. 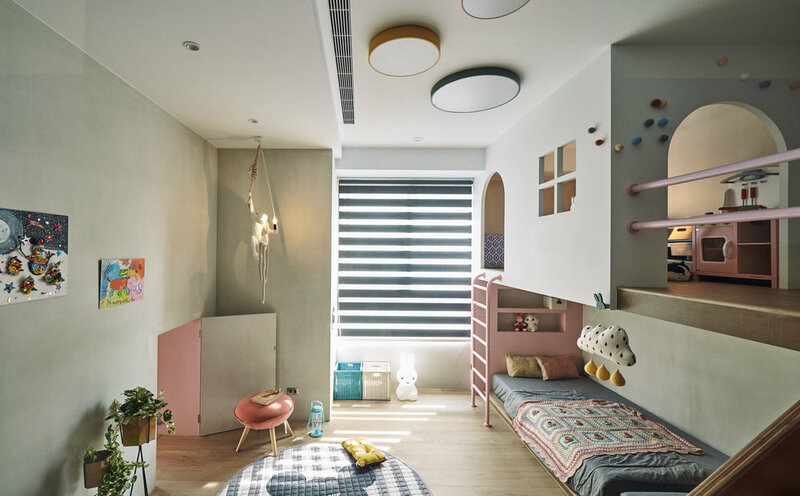 They wish to make the home into a space ideal for parent-child activities with a rich atmosphere for this theme. The original layout is four rooms, which lacks a feeling of spaciousness and the shared areas receive insufficient sunlight. 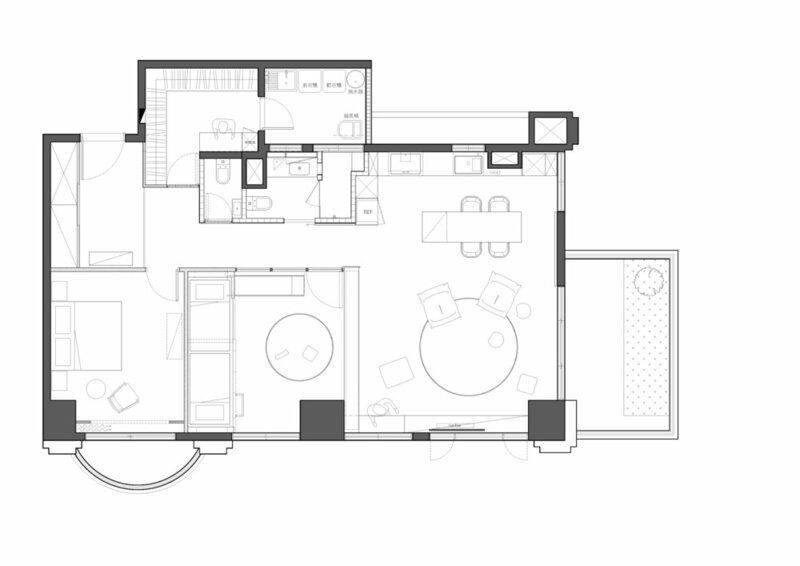 After a thorough reconfiguration of the layout and movement routes, the home is transformed into three distinct spaces: conjoined living room-dining room, master bedroom and children’s room. They are connected by a blue corridor starting from the atrium. 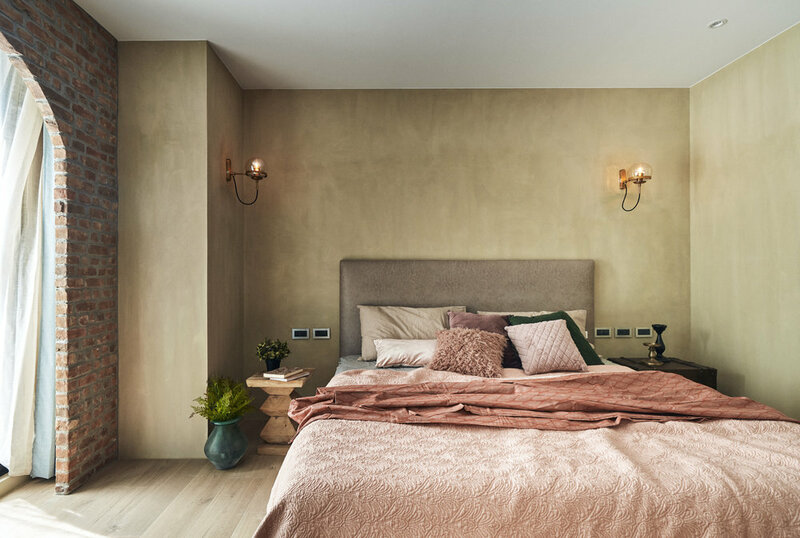 All areas make use of a newly-developed customized earthen-colored cement as the foundation, which gives the wall surfaces a modest and warm natural texture and is easy to match with furniture. The original master bedroom had a large balcony, which is now a part of the living room. This allows the actively-used shared spaces to enjoy ample sunlight. 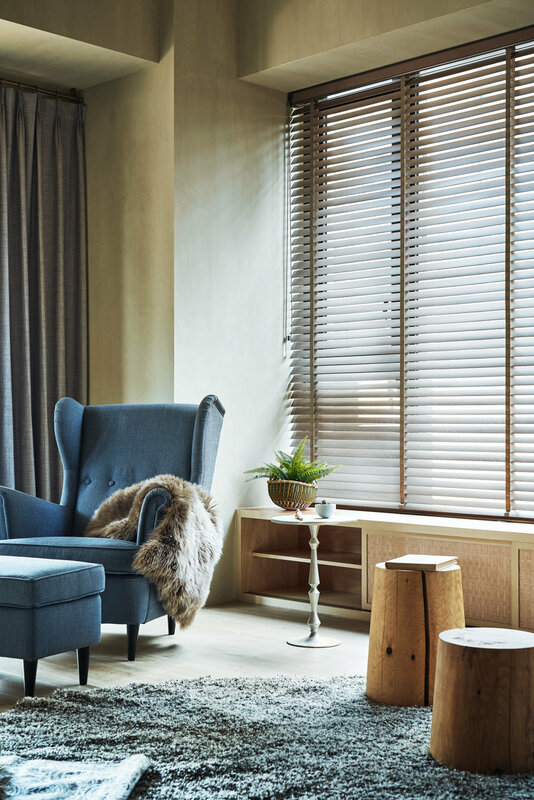 Red-brick walls and wooden materials are all imitation-weathered, thus creating a leisurely countryside atmosphere. Combine this with furniture and lighting with clean lines and metallic inlays to create a modern look. The original kitchen, which was dark and crowded, has been changed into the master bedroom. On its balcony, a large arched brick wall was built simulating European plazas, giving it a “time travel” look and feel. The matching white gauze curtain is soft, light and dreamlike, enhancing the effect of relieving pressure. The children’s room is an adventure amusement park. The entrance is ingeniously inserted in the center of the living room bookshelf. A small pink “doggy door” seems to evoke Alice in Wonderland where Alice could enter the secret passage only after drinking the shrinking potion. The interior is open and spacious. The customized playground slide is both a bed and an amusement. It fully takes into account the safety of the children’s night activities. 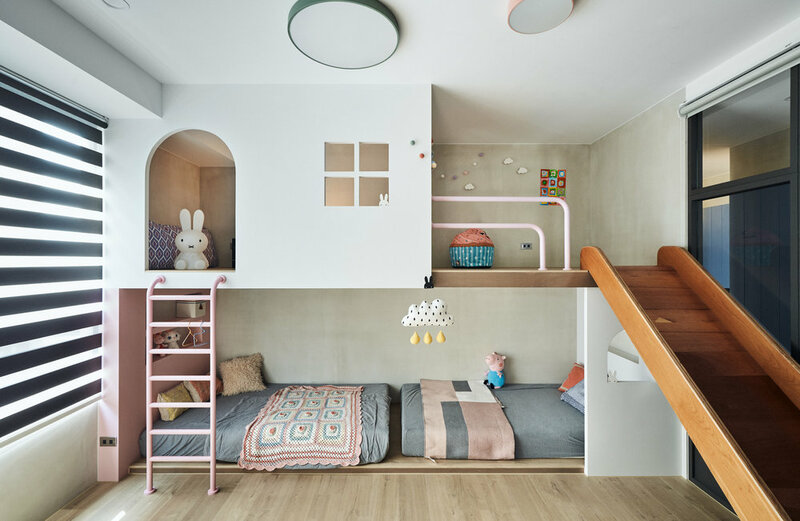 The bed is designed to be the lower bunk while the upper bunk is the “observatory fortress.” Pastel colors and rounded lines inspires the children room’s fairy tale atmosphere. On the side of the corridor, there is a glass partition, making it convenient for parents to watch over the young children. It also allows light from the room into to the corridor, giving the blue corridor several distinct shades of lighting. The visual depth is extended through the light ray, leading the movement routes into the other rooms. The lighting direction of roller shutter is uniform. Lighting and concealment are taken into account. The storage function is facilitated by the shoe cabinet in the atrium. The clothes are stored in the dressing room connected to the balcony. In addition to opening up all the movement routes, it also conserves the space of the wardrobe in the bedroom. This compound, shared feature is also shown in the kitchen: the 90 centimeter tall island has three functions: a dining table, tableware storage and desk. 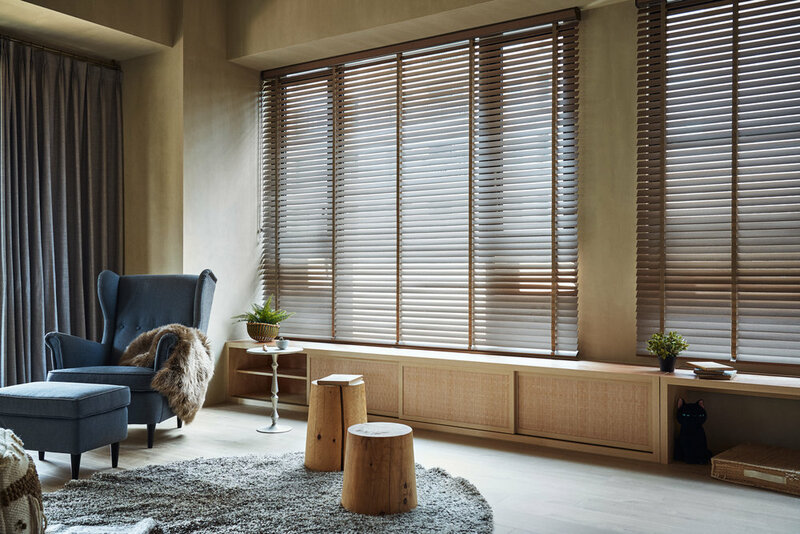 Not many pieces of furniture are needed but they need to be ingeniously chosen in order to naturally make more room for lifestyle activities so that every trip home is full of anticipation.